If you have spent any time at all considering purchasing a sewing machine, you know that some of them are worth a pretty penny. You are also probably aware of the company names that seem to overpower the rest, including Singer. For the long-time sewing enthusiast, dropping a few hundred dollars on a sewing machine that you use countless times per day, 365 days of the year, probably seems like a well-deserved, but not outlandish, treat. However, if you are just delving into the sewing world, peeking at the Singer Sew Mate 5400 could leave you with exactly what you need, without all the sticker shock. 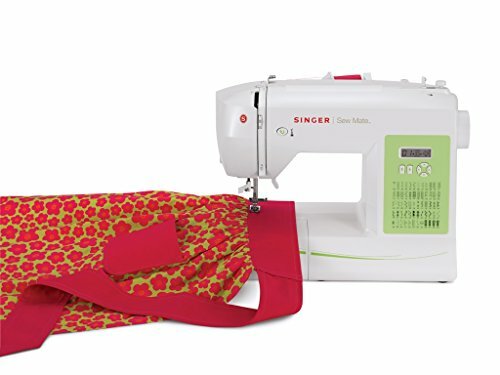 Overall, the Singer Sew Mate 5400 is the perfect choice for anyone who is looking to try their hand in the sewing world for the first time but is not quite ready to invest too much money into it. 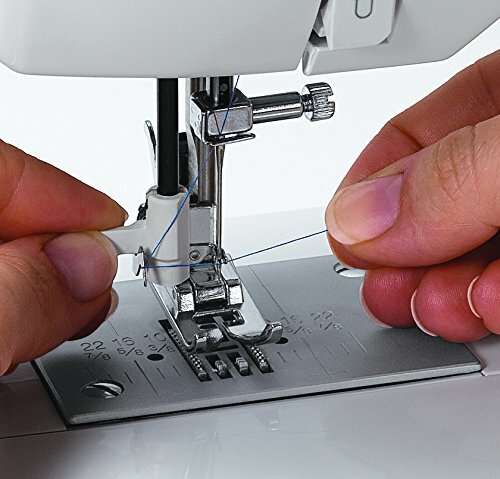 With its low cost, easy set-up, 60 built-in stiches (including 4 different buttonholes), and automatic needle threader, it meets the needs of just about any casual or beginner seamster or seamstress. If you are familiar with the world of sewing but simply need something that takes out all the hassles so you can take care of a project here and there, the features of this machine could be exactly what you need. If you are more committed to and well-versed in the sewing realm, you might benefit from investing a little more money into a higher-end machine to avoid the frustrations that can come with a low-cost one. The Singer Sew Mate 5400 is considered an entry level sewing machine and comes in at an entry level price point. As with just about anything, fewer dollars means fewer features. However, comparing this machine to the other budget options quickly reveals that you get way more with the 5400 than with most of the others. For someone who either casually sews on occasion, is new to sewing altogether, or is looking to have a backup machine on-hand, the option of spending a relatively small amount of money without skimping out too terribly on features is appealing. Included with this great price is a limited 25-year warranty, which includes a 5-year warranty for electric components and a 1-year warranty on any necessary adjustments. With that, even though there are some complaints about operation or structure issues with this product, you can rest in the knowledge that Singer’s warranty should prevent you from spending more, in the event that your machine needs repairs. The Singer Sew Mate 5400 comes with both a Quick Start Guide and a Machine Intro DVD. Using these, even the newest user should be able to get working on projects right away. It seems like setting this machine set-up is a relatively no-fuss process. In addition, Singer’s included Machine Intro DVD allows you to make sure you are taking full advantage of all its great features from the very start. The Singer Sew Mate 5400 comes with 60 pre-programmed stitches so that it is ready for use immediately after setup. These stitches include 8 basic stitches, 8 stretch stitches, 5 buttonhole stitches, and 40 decorative stitches. Additionally, it comes supplied with three different presser feet. This allows you to quickly change to exactly what you need without the concern of whether or not you have the right supplies. The included presser feet are an all-purpose foot, a buttonhole foot, and a zipper foot, ensuring you can get started on your projects right away. Aside from beginners and casual seamsters, some other people this machine might appeal to are those that need a sewing machine that can be taken on-the-go. It also has built-in accessory storage within the machine. With that, even though it does not come with a cover, it can quickly be packed up and you will always have the option of purchasing Singer’s universal machine cover. Whether you travel with your sewing supplies a lot or you just need to be able to set up and take down your sewing station conveniently, the Singer Sew Mate’s compact size could be exactly what you are looking for. Weighing in at less than 14 pounds and 16.5 x 7.8 x 13 inches, moving this sewing machine around will present much less trouble than the bulkier, more expensive options. This is awesome, especially considering all the features Singer has managed to pack into this little machine, allowing it to function as both a utility and a crafting machine. Additional features that this product boasts include automatic stitch length and width adjustment. 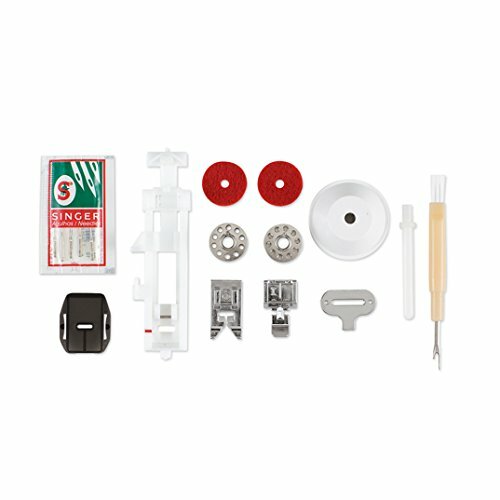 For those who are new to the field of sewing, this is going to allow you to skip a huge amount of headache and hassle. If you are more familiar with making manual stitch adjustments, you are likely well-aware of the time and frustration that can be saved by simply pressing a couple buttons to set the exact stitch length and width that you need. On top of that, there is automatic reversal capabilities. Whether you want to reinforce your stitch once or three times, skip the adjusting and re-aligning and simply press one button to send the machine into reverse mode. 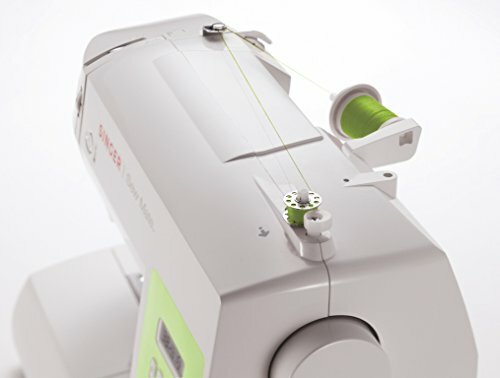 In addition to the built-in stitches, this machine boasts an automatic needle threader, ensuring that its user will not be slowed down by the tedious process of threading needles. Never worry about the eye-strain from needle threading again. Let the Singer Sew Mate 5400 take of it for you. On top of all the frustrating steps in sewing that Singer seems to have taken the work out of, this machine is also free arm convertible. Whether you are working on clothes, dolls, or other hard-to-reach areas, the Sew Mate will make them a breeze. This would not be a complete review if I skipped out on addressing the negative reviews. The main concern of people who reviewed the Singer Sew Mate 5400 seems to be a problem with the needle breaking. It seems a good portion of people experienced this, but many times it seems it turned out to be a faulty machine. People who had their machine replaced by Singer seem to have had positive outcomes. Additionally, some people seemed to experience loud noises and thread breaking. However, looking closer, it looks like many of the people who had these issues had purchased refurbished machines, which makes me think they might have been more of the faulty ones. People reported seeing a C4 error message, which according to the manual, indicates a bobbin error. Further, some people report receiving a range of other error messages, including some that do not have an explanation in the product’s manual. Unfortunately, especially in light of the reports of machine errors, a poor customer service experience with Singer was also a common theme in negative reviews of the product. These complaints went as far as saying customers remained on the phone for hours without ever being connected to a representative to address their concerns. They have a troubleshooting section on their website, along with a YouTube channel that addresses many of the common issues. Additionally, they have both an email address and a phone number that can be called during business hours. However, a handful of customers did report having trouble contacting anyone for help, which could be a major headache and deterrent for many people. 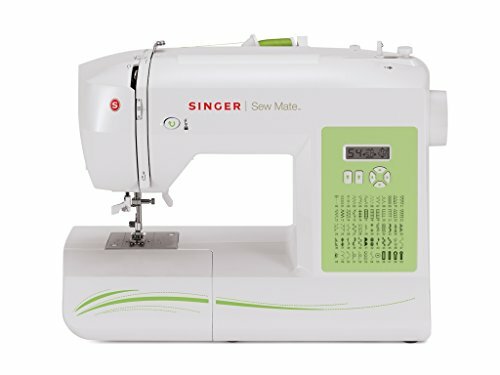 Overall, the Singer Sew Mate 5400 has some pretty great features, especially at its price point. Getting started in the sewing world can be pretty costly, and that is reason enough to scare off many potential participants from further pursuing the craft. With the Singer Sew Mate 5400, a newcomer has the option of investing just a small amount of money to get started without sacrificing the necessities and even a few other extra features. There is concern floating around online about some mechanical errors, but it seems most of these issues have been rare and resolved for those that are patient with lacking customer service. These issues are, arguably, a small risk to take for a value this awesome. Don’t drop hundreds of dollars to explore a new craft, casually make clothing repairs, or have a sewing machine that can travel with you when the Singer Sew Mate 5400 could be exactly what you need!